Rain Delays the Start of the Snow Ball Derby Update 4:20 PST - The Derby will go green at 5 p.m. central time tomorrow afternoon. It will be run as a ‘controlled caution’ race so teams will not have to worry about live pit stops – helping teams who hired over the wall guys and do not wish to pay them for a second day. The gates will open at noon. Speed51.com will continue to provide their great coverage on Monday as well. Update 3:53 PST - A vote has been taken and today's race has officially been postponed until Monday. 49th Snowball Derby Red Flagged By Weather. 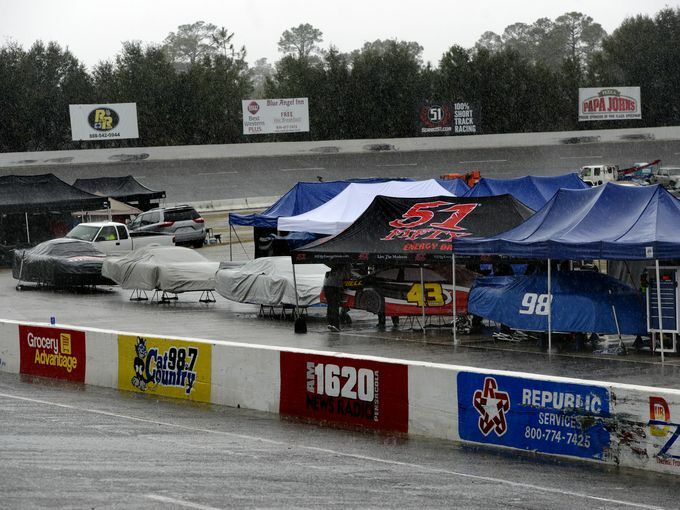 Heavy rain showers soaked the track this morning delaying the Snowball Derby. However, Pensicola, Florida is now experiencing the sporadic appearance of blue skies. The race promoter has borrowed a jet dryer from Darlington Raceway. It will take approximately an hour or so to get the half-mile oval dry enough to race after the rain stops. Having learned from this same ‘rain soaked track’ situation a few years back, Five Flags Speedway has also placed in new drainage in turns one, two, three, and four. They are hopeful of getting the 300 Lap race in today. For detailed updates for the rest of the day, click on www.speed51.com for their Trackside Now coverage. 30 1 Derek Scott, Jr.
#NASCAR Driver’s Start Your Engines!!! Will Benjamin Return to the K&N Pro Series East? How Fast Has Richard Petty Driven? Will Partridge Return to the K&N Pro Series West?